In a recent post to his blog, Jef Fincher created an analogy between ocean sailing and the course corrections needed to steer the Affordable Care Act (ACA) through turbulent waters without doing irreparable harm to the “SS United States”. That analogy brought to mind another one involving a ship and the ocean– “the unsinkable” Titanic. Like the Titanic, the “SS United States” has been hailed as unsinkable. For over 200 years, through war, natural disasters, economic strife and cultural upheaval, it has been just that. But never before has there been an iceberg of the proportion of the ACA looming ahead. Nor has the SS United States ever been captained by a helmsman with such little regard for the consequences of running full steam ahead through the darkness. But alas, it appears that like the captain, many of the passengers and members of the crew have drunk too deeply of the free champagne to recognize the dangers of a high speed collision with an iceberg of titanic proportions. Certainly, an experienced captain, warned of unknown and potentially dangerous conditions ahead, would remain vigilant and ready to moderate speed or change course in ample time to avoid disaster. But the captain of the SS United States seems incapable of understanding that dangers do lie in the darkness ahead, and resolute in his commitment to press on. While he has decided to proceed at a tick less than maximum speed, his decision to do so was motivated not by a desire to avoid a catastrophe, but by concern about running out of fuel. Fuel that will be of little use when the ship is injured and foundering. 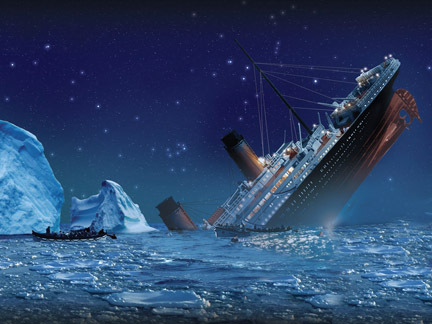 To take the Titanic analogy a bit further, just as any possible encounter with an iceberg could have been avoided had the ship stayed in port, the potential for the SS United States to strike a metaphorical iceberg could have been eliminated had an inexperienced captain not taken the ship into the turbulent waters of health care reform. But ships, both real and metaphorical, can not serve the purpose for which they were created by staying in port. And so the ship has sailed and is hurtling towards disaster while the captain and most of the crew ignore warnings of the dangers ahead. Fortunately, the SS United States has a sufficient number of lifeboats, and rescue ships are standing by. That will ease the pain, but it won’t prevent the disaster.